Close together in the sky, Pollux and its brother star Castor are easy to compare. Pollux is brighter and golden in color, while Castor is fainter and white. Golden Pollux. You almost never see an image of this star in the sky without its fellow star, Castor. But we chose this image because it shows Pollux’ yellowish color. This image is from a post on ScienceBlogs about seeing red in star colors. Pollux, otherwise known as Beta Geminorum, is the 17th brightest star in the sky, prominent in evening skies from late fall through spring each year. It is ideally placed for viewing in March, when you’ll find this star highest in the sky during the evening hours as seen from around the globe. Follow the links below to learn more about the star Pollux in the constellation Gemini. How to see the star Pollux. History and mythology of Pollux. The Geminid meteors, which happen every year in December, radiate from near stars Castor and Pollux in Gemini. How to see the star Pollux. As seen from latitudes like those in the U.S., Pollux and its nearby companion, Castor, pass high overhead. There are no bright stars immediately around them, which makes them stand out and easy to identify. They are noticeable for being bright and close together, and so are often referred to as twin stars. However, there are plenty of bright stars in this general area of the sky. A line drawn from Regulus in Leo to Capella in Auriga passes near Pollux and Castor. Similarly, a line drawn from Rigel through Betelgeuse in Orion, and extending perhaps three times the distance between them also passes near Gemini’s twins. Pollux is a yellowish color, while Castor is white with perhaps a tinge of pale blue. One other way to distinguish which is which is to notice that Pollux is slightly brighter than Castor. Pollux is opposite the sun (opposition) on about January 15. This means that it is rising as the sun sets, and reaches its highest point at about local midnight. This situation is called a “midnight culmination,” and marks the time when the star crosses the meridian, an imaginary line drawn from due north, through the zenith overhead, down to the horizon due south, at midnight. Traditionally the night of midnight culmination is considered the best time for observation because it is the time when the star is in the sky all night long. However, you can easily see Pollux in the evening as early as early each year as mid-October, when it rises in the northeastern sky before midnight (daylight savings time). From central Alaska, northern Canada and parts of Scandinavia northward, Pollux is circumpolar. Pollux science. Pollux is classified as a “K0IIIb” star. The K0 means that it is somewhat cooler than then sun, with a surface color that is a light yellowish orange. (Keep in mind that the color a star appears depends significantly on the sensitivity of the observer’s eyes, and that color is difficult to discern with most point sources.) The “III” is a “luminosity” class designator, indicating basically how much energy it is putting out, which is largely dependent on size. A type-III star is considered a “normal” giant or just a giant. Finally, the “b” indicates that Pollux is slightly below the average luminosity for this class. A relatively close 34 light-years away, Pollux is about 31 times as bright as our sun in visible light, but Pollux also pumps out a good bit of energy in non-visible infrared radiation. With all forms of radiation counted, Pollux is about 46 times more energetic than our sun. 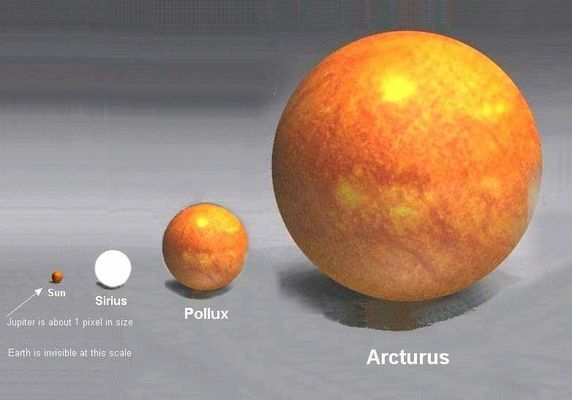 According to Dr. James Kaler, Pollux is just under 10 times the diameter of the sun, making it a little less than 8 million miles across, and not quite twice the solar mass. Although Castor, its fellow star as seen on Earth’s sky dome, is only a couple dozen light years from it, Pollux has no true gravitational companion star that we know of. However, a large planet, at least 2.3 times the mass of Jupiter, was confirmed in 2006 to be orbiting Pollux. This planet, Pollux b, is not likely to harbor intelligent life, but at 34 light-years distance, it is one of the nearest of the 760 extrasolar planets discovered. Pollux b is orbiting Pollux with a period of about 590 days. 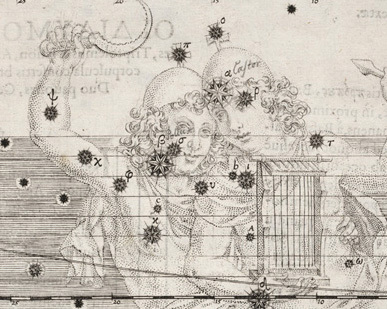 Pollux and Castor in Johann Bayer's star atlas Uranometria Omnium Asterismorum, first published in 1603. It was the first atlas to cover the entire celestial sphere. 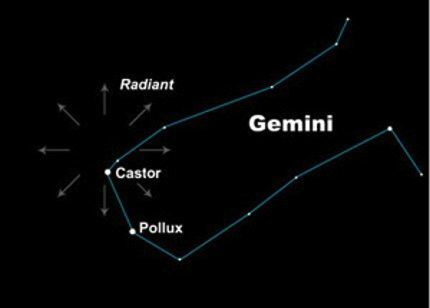 In it, Bayer gave Pollux the label Beta in Gemini, even though today we see Pollux as brighter than Castor, the Alpha star. History and mythology of Pollux The Greek letter Beta is normally reserved for the second-brightest star in a constellation. But, as with Rigel in Orion, Pollux wears the designation Beta in its constellation, even though it noticeably outshines Castor, which is Gemini’s Alpha star. Being so close together in the sky, Castor and Pollux are easy to compare. If you look, you’ll agree. Pollux is brighter. It is possible that one or both stars have altered in brightness since German astronomer Johann Bayer assigned the designation about 300 years ago. Another explanation is that Bayer sometimes labeled the stars in their order of rising. Here Castor rises slightly before Pollux, and hence Castor, the dimmer star, received the Alpha label. This explanation also fits for Betelgeuse and Rigel in Orion, as viewed from the latitude of Germany, because the Alpha star, Betelgeuse, rises slightly before the truly brighter star, Rigel. However, there is a geographical dependency here. From some locations south of the Equator, both Rigel and Pollux rise first. The name Pollux is of Greek origin and apparently refers to a boxer. The original Greek word seems at odds with this idea, however, as it apparently means “very sweet,” which may allude to the legendary warm and fraternal relationship between the two brothers. In Greek mythology, Pollux was one of two brothers who figured prominently among Jason’s argonauts. By most accounts, they were sons of Leda, Queen of Sparta, but Castor had a mortal father and hence was mortal himself. Pollux was the son of Zeus and immortal. Pollux also had a famous sister, Helen of Troy. 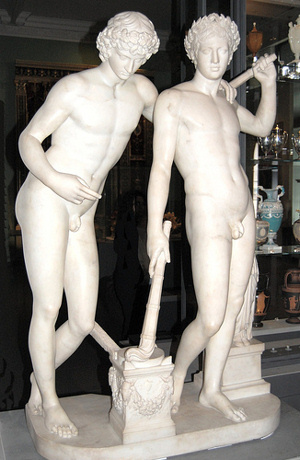 There are many variants to the story of Castor and Pollux, but, by most accounts, Castor was killed in battle and Pollux could not bear to live without him and begged Zeus to let him die, too. Zeus could not grant the gift quite as asked, since Pollux was a god’s son and therefore immortal. But Zeus decreed that Pollux would spend every other day in Olympus with the gods, and the rest of the time in the underworld with his brother. To honor Pollux’ devotion, Zeus placed their constellation in the sky as a remembrance. Pollux and Castor are also sometimes identified with Apollo and Hercules or with the founders of Rome, the brothers Romulus and Remus. While in many cultures they were the twins, India they were the Horsemen, and in Phoenicia they were the two gazelles or two kid-goats. It is said that in China they were associated with Yin and Yang, the contrasts and complements of life. 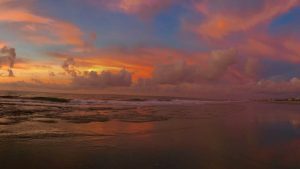 In all of these cases, they represent two of something – and you will see why if you gaze upon these two stars in the sky, which are bright and close to each other. Pollux’s position is RA: 7h 45m 20s, dec: +28° 01′ 35″.